Editor’s Note: Last night Patagonia’s Foot Tractor Wading Boots won “Best of Show” among all new products at the 2018 IFTD Show in Orlando. Patagonia has announced the release of two new wading boots. The Foot Tractor and River Salt Wading Boots are the result of design and development cooperation with Danner. VENTURA, Calif. (July 9, 2018) — Patagonia is pleased to announce two of their most innovative fly fishing products to date — the new Foot Tractor Wading Boots and River Salt Wading Boots. These boots are the culmination of years of hard work and research and development in collaboration with Danner, the iconic boot maker and Vibram, maker of high performance outsoles. Patagonia’s and Danner’s quest to build the most durable and highest performing wading boots possible has led to what Patagonia contends are the best boots they have ever made and possibly the last ones anglers will ever need to buy. To achieve their goals of maximum durability and performance in a long-lasting U.S.A.-made boot, Patagonia paired their expertise in fly fishing and product innovation with Danner’s proud tradition of quality and craftsmanship. Made by hand in Portland, Oregon, both boots are engineered for the most demanding wading and fishing. And with treated full-grain leather and stitch-down construction, they’re designed not only for durability but also to be resoled and even completely recrafted as they wear to keep them on the water and out of the landfill. The durability of both the Foot Tractor Wading Boots and River Salt Wading Boots are the result of stitch-down construction of waterproof full-grain leather and tough 1000-Denier nylon. The saline treated leather is waterproof, non-shrinking, and non-cracking. With technology that prevents swelling, these boots prevent water retention and maintain their appearance. Perforated drains clear water quickly, and nylon webbing saves weight while maintaining strength and support. Nylon-coated hardware also adds an additional element of durability. The stitch-down construction consists of interlocking thread that increases the durability of the boots while also allowing the boots to be resoled and recrafted by Danner. And both boots provide comfort and stability throughout from an insole board, an internal shank for arch support, a cushioned midsole for impact absorption, a wider platform for increased ankle support, and a lace-to-toe design that allows for a more customized fit over the top of the foot. The River Salt Wading Boots feature low profile adjustable speed lacing evolved from Danner’s Marine Corps boots, and a bi-fit board combines shank, lasting board, and PU midsole into a single piece, thereby providing a lightweight platform. Additionally, a VIBRAM® Megagrip outsole with sticky rubber delivers impressive traction in an out of the water, as well as increased durability. The River Salt Wading Boots are designed specifically for the Middle Fork Packable Waders, wet wading, and the flats. They will be available in Feather Grey for $449. The Foot Tractor Wading Boots have an adjustable lacing system and a 5mm rubber midsole. With a VIBRAM® Idrogrip outsole for durability and performance, anglers have the choice of sticky rubber ($499), felt ($499), and aluminum bar ($549) for their preference of best traction. 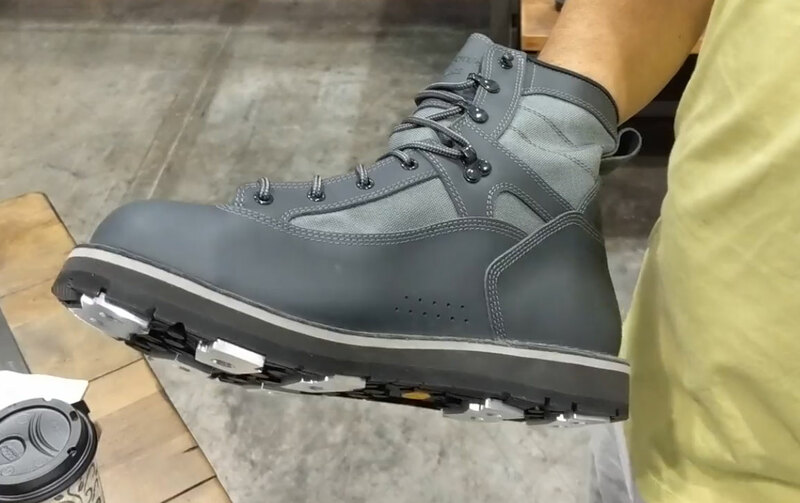 The Foot Tractor Wading Boots will be available in Forge Grey. And while Patagonia and Danner built these boots to endure, the companies’ shared values also brought them together to make boots that could very well be an angler’s ultimate boot purchase. Both boots have options for recrafting at Danner’s world-class facility in Portland, from replacing outsoles and hardware to repairing stitching and reconditioning the leather. (You can learn more about Danner’s recrafting here: http://www.danner.com/boot-recrafting/ ) Patagonia hopes that anglers will avoid the practice of sending boots to the landfill and will keep these boots in use for many years. This revolutionary approach cuts down on production, spending, and waste and provides the longest possible lifespan for these boots. The Foot Tractor Wading Boots and River Salt Wading Boots will be available February, 2019. Founded by Yvon Chouinard in 1973, Patagonia is an outdoor company based in Ventura, California. A Certified B Corp, Patagonia’s mission is to build the best product, cause no unnecessary harm and use business to inspire and implement solutions to the environmental crisis. The company is recognized internationally for its commitment to product quality and environmental activism, contributing over $89 million in grants and in-kind donations to date. For more information about Patagonia Fly Fishing, please visit their website and follow Patagonia Fly Fish on Facebook, Instagram, and Twitter.